The Federation of Ethnic Communities’ Councils of Australia (FECCA) said today that a move by the Fair Work Ombudsman to allow access to 40 languages other than English on its website was a major step forward in access and equity for migrants. Visitors to www.fairwork.gov.au can now instantly translate website content, including fact sheets, information guides and templates, with just the click of a button. “Many of them are underpaid and exploited even though they fill key positions in the workforce,” she said. Ms Patetsos said that workers of CALD background were crucial to Australia’s economy and society. They care for the nation’s elderly and disabled, support the agricultural sector and work to grow Australia’s IT and high tech companies. “This website facility will help overcome the language barriers which so often contribute to their vulnerability,” Ms Patetsos said. The Federation of Ethnic Communities’ Councils of Australia (FECCA) says that a Bill introduced today to the Australian Parliament will discriminate against tens of thousands of Australian residents simply because they are new migrants. The Government’s Social Services Legislation Amendment (Encouraging Self-sufficiency for Newly Arrived Migrants) Bill aims to extend the waiting time for new migrants to access welfare benefits to three years from its current two years. The Chairperson of FECCA, Ms Mary Patetsos said today that the move would impose considerable hardship. “Migrants who come here have always needed time to establish themselves in housing and employment. These changes make it harder for them to settle in this country and FECCA appeals to the Parliament to reject the Bill,” Ms Patetsos said. FECCA is the national peak body representing Australians from CALD backgrounds. FECCA’s role is to advocate and promote issues on behalf of its constituency to government, business and the broader community. The Federation of Ethnic Communities’ Councils of Australia (FECCA) has paid tribute to Sir Nicholas Shehadie, a pivotal figure in the formation of SBS. The Chairperson of FECCA, Ms Mary Patetsos, said that Sir Nicholas was committed to the building of a successful multicultural Australia. “Nicholas was not only a great rugby player and administrator for Australia but a champion of an Australia based on immigration and its many benefits,” Ms Patetsos said. The Federation of Ethnic Communities’ Councils of Australia (FECCA) has urged organisations involved in aged care to make written submissions to the Federal Government on its Aged Care Workforce Strategy (ACWS). The Department of Health is offering extensive consultation on the Strategy, via its ACWS Taskforce. As well as inviting written submissions for the next five weeks, the ACWS Taskforce is offering a series of community consultations with its Chair, Professor John Pollaers in Brisbane, Melbourne and Hobart. More information can be found at the Taskforce website. She said that CALD Australians are heavily represented in the aged care workforce and often face discrimination and racism. They occupy the full range of occupations, from professional through to carers and support staff. Australia’s migration program to support the needs for a diverse and skilled aged care workforce. “The skills and welfare of our workers in aged care are so important that we urge everybody involved to take this opportunity to have their say,” Ms Patetsos said. FECCA is the national peak body representing Australian from CALD backgrounds. Our role is to advocate and promote issues on behalf of its constituency to government, business and the wider community. 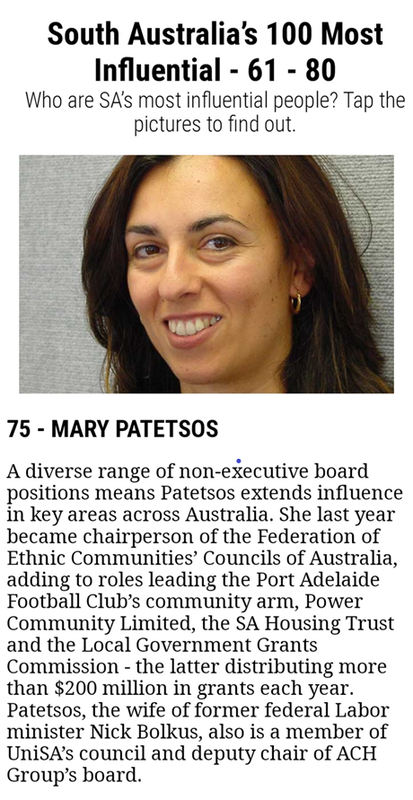 FECCA Chairperson, Ms Mary Patetsos, has been named in Adelaide Advertiser’s ‘Most Influential’ list. The Federation of Ethnic Communities’ Councils of Australia (FECCA) has once again taken the opportunity to affirm, in a submission to the Federal Government on Australia’s migrant intake, that migration is central to Australia’s continuing economic, intellectual and social success. There should be no changes to either the waiting period or English language requirements for permanent residents to apply for Australian citizenship. FECCA’s full submission can be found here. The Federation of Ethnic Communities’ Councils of Australia (FECCA) has made a detailed submission to the Senate’s Select Committee on the Future of Work and Workers. The submission recommends actions to improve opportunities for workers of culturally and linguistically diverse (CALD) background to access secure jobs, without discrimination. “FECCA believes that workers of CALD background should have equal opportunity with other workers, that they should know their rights and that employers should ensure they are not subject to discrimination and exploitation,” the Chairperson of FECCA, Ms Mary Patetsos, said today. A plan to address the increasing need for bilingual aged care workers to cater for the ageing CALD population.